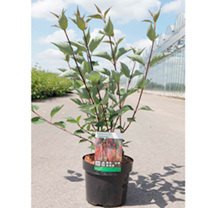 Cornus alba 'Kesselringii' is grown for its vibrant purple, almost black bark in winter. It has rich green oval-shaped leaves that turn violet in autumn making for a second season of colour. Dogwood will typically grow in almost any soil, but does love wet ground. The common name, Dogwood, is of Saxon-origin, meaning wood for skewer - the straight stems make ideal skewers for roasting. Flowers May-June. Height 150-200cm. Supplied in a 3 litre pot. Best planted in full sun or partial shade in well-drained to poorly-drained, neutral to acidic soil. January/February is the time to prune these shrubs.